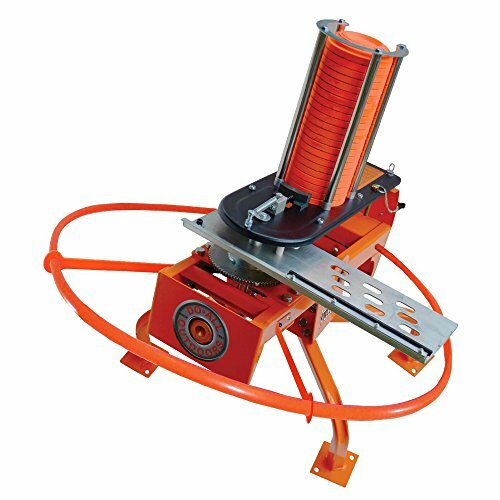 FLYING FOWLS DOWN: Our Fowl Play Automatic Trap has a 25 Clay Target Feeder that can throw clays 55 yards plus and has a 2.5 second recycle time. The ability to add multiple extension cords gives you better shooting ability and shot scenarios. It handles all standard, bio's, 108mm, and 110mm clays. PROFESSIONAL GRADE MATERIALS: Arm made of aircraft aluminum with a 5 -35 degree angle of adjustment allowing for different throwing planes. Our silky smooth feeder tray provides a flawless transfer of pigeon onto the throwing arm. The target Auto feeder loader loads directly to the throwing arm. SAFE & ADJUSTABLE OPERATIONS: Safety pin ensures that the arm does not fire in an accidental release. It features an attachable safety ring guard and a foot pedal release with 25 foot cord with an adjustable limit switch for timing adjustments in the field. SUPERIOR HOLD: Ground spikes are included to provide a superior hold and reduction of vibration. The attachable Hi-Viz Orange safety ring provides a great visual indicator of the throwing arm path. AMP UP YOUR SKILLS: Providing a great way to practice your duck hunting skills off season, Fowl Play runs off a 12V deep cycle marine battery (not included) and is compatible with the Do-All Outdoors Wobbler and wireless remote to further allow you to customize your hunting practice time.